Fit Fluential Mom: Why You Crave More Carbs in the Winter! When winter comes, our intake of comfort foods goes up. Whether you’re lounging about in balmy California or bundling up to brave the sub-zero temps of Minnesota, you’re likely to crave carbs — healthy ones like potato-rich stews and hearty soups (like this Hearty Vegetable Soup) and not-so-healthy-ones like overly sauced pastas or cookies. One possible theory for this is that the shorter days are to blame. That’s because nearly everybody suffers from a low-grade sadness brought about by lack of sun exposure. “Human beings are far more complex than plants, but we still need sunlight,” says New York-based nutritionist Sophie Anson. “A lack of sunshine and vitamin D is linked to depression and fatigue.” In the winter months, many people have lower blood levels of serotonin — a chemical in the brain which, according to Dr. Wendy Miller, M.D., Chief of Nutrition and Preventive Medicine, Beaumont Hospital-Royal Oak, “produces a calming effect and helps relaxation.” A lack of sunlight negatively affects serotonin levels, much like a lack of confidence negatively affects sexual activity. Big carb hits bump up production of serotonin and dopamine, another feel-good neurochemical that, according to Miller, increases motivation and alertness. After eating that candy bar, we can expect a short-lived improvement in our mood to counter the blahs. Unfortunately, this spike is followed by a sugar low and plummeting serotonin levels, leaving us feeling as bad as we did before we ate — or worse. “We crash and eat more again,” says Anson. It’s a downward spiral not unlike binge-watching the E! channel. 1. Vitamin D drops or supplements can help, but nothing comes close to sunshine. Anson recommends getting outside for 15 minutes a day, and exposing yourself to the sun so your body can produce vitamin D. “Pull up your shirtsleeves or your pant legs and do it without wearing SPF. You’ll feel better than if you ate that piece of cake.” Of course, you won’t feel great at all if you pull up your pant legs too far — resulting in an indecent exposure arrest. 2. Focus on complex carbs. 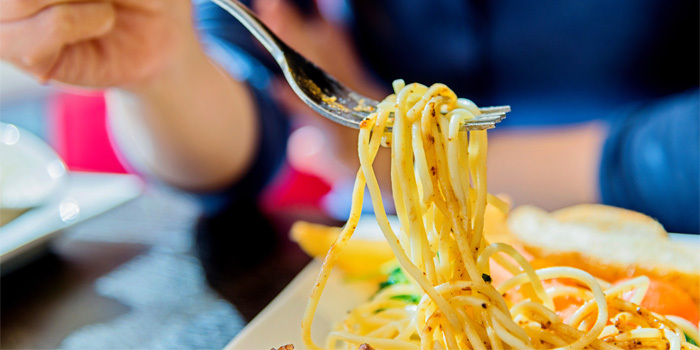 “Eating healthier carbs also has a beneficial effect on serotonin in the brain,” says Miller. Eat oatmeal with whole grains — wheat germ or flax seed — and lowfat milk, advises Shannon L. Szeles RDN, Clinical Dietitian at Beaumont Hospital-Royal Oak. “Or make a snack of a whole wheat English muffin with nut butter.” The combination will keep your sugar and hormone levels steady rather than causing spikes and crashes. Plus, it’ll help you get a little more fiber in your diet — and happy plumbing is always a mood lifter. 3. Alternatively, turn to low-fat proteins. “Some people won’t benefit as much from the complex carbs,” says Szeles. “Instead, they should have almonds as snacks.” Not sure whether you’re a complex carbs or low-fat protein person? Szeles advises that you track yourself for a few days: “Write down how you feel within 30-60 minutes after eating carbs. Hungry again? Sluggish? Stick to protein instead,” says Szeles. And if you’re still sluggish, try getting more than four hours of sleep at night. 4. Exercise. “It’s a surefire way to increase feel-good hormones,” says Szeles. Do you normally jones for a late-afternoon cookie? Take the stairs up and down a few flights instead. It won’t taste as good, but it’ll release the same hormones in the brain. 5. Establish a routine. “An exercise regimen and eating with consistency will stabilize everything,” says Szeles, “by keeping your hormone levels on an even keel.” This routine should include Facebook breaks, taken as necessary. 6. Don’t ignore the cravings. “Don’t think, ‘Oh, I’m craving these really bad foods, so I’ll get rid of all the carbs,’” says Anson. “Excluding all carbs from your diet does more harm than good — you’ll just feel hungrier.” Rather, address the cravings in a more healthful manner. You’ll feel a lot better with a snack like yogurt or almonds — something that delivers sustainable energy. Of course, if you really want the cookie, eat the cookie — within moderation, of course.